This short article is to share some excellent Q&A following our recent series on "patience". Q. Won't I be annoyed if I don't take a third attempt short and the market moves lower without me? Ok… maybe a little. Maybe briefly. A third attempt may well have worked. But given my emotional state (interfering with my ability to make quality decisions) and the fact that I was fading the immediate, short-term momentum, there is a much higher likelihood of it losing. I don't have to catch every move. I trade the odds. And from that perspective the smarter option is to stand aside. If the lower odds outcome happens and the market moves lower without me, so what. 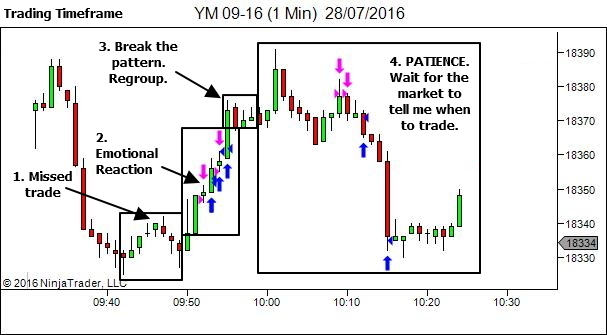 The smart decision was to not trade because more often than not the third attempt would have stopped out as well. You should never be afraid to walk away. Take whatever time is necessary to clear your mind. It's not quitting. It's not failure. It's a tactical withdrawal to regroup in order to allow you to resume the fight again when the odds are more in your favour. You don't have to trade every price sequence. If the market offers something that is not comfortable, or that's not easy to read, stand aside and wait. The time to trade is ONLY when you feel it's flowing nicely and you're completely in sync with the price swings. That is when you trade. No other time. Pre-trade, ask yourself this question – "Is the market telling me to take this trade, or is it coming from inside me?" Never be afraid to step away.It's not quitting. It's not failure. It's a tactical withdrawal to regroup in order to allow you to resume the fight again when the odds are more in your favour. 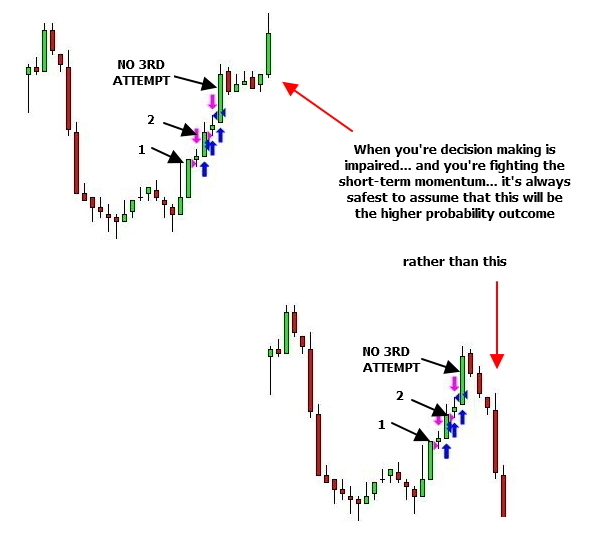 When the market rewards us for taking low probability entries, it will then take a while for us to realize that in the long run such moves are ill-conceived. This realization process will cost us *way more* than whatever profits our low probability trade generated that one time, or two. I learned it the hard way! Yes, the market is a harsh teacher. This is really great. Just the mindset flip I needed, because I used to very much see it as quitting, and honestly I am happy to have been wrong. Because about 9 bad trades and 1 good one later, it just seems like i am trying to saw down a tree with a toothbrush. Also thank you Michael, I found your input valuable aswell and it’s not the 1st time either. 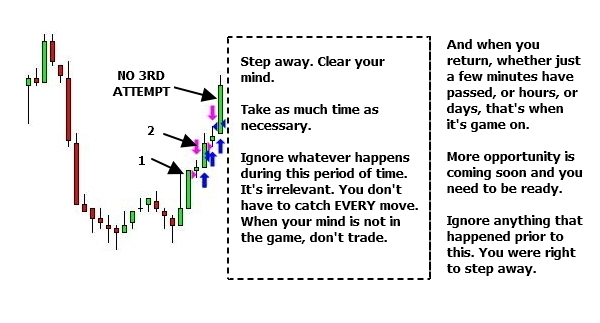 Speaking of experience, if it may help: every time you enter a trade and “regret” it a couple minutes later because you have a small loss and the price is not budging, instead of waiting because your stop is still far away, just get out. Learning to be a “happy quitter”, is another thing that improved my results almost overnight. Standing aside when the odds are not in our favour is a big part of this, ensuring we limit further damage. And when we do trade… keep those losses small. I’m spamming, I know: I promise not to comment on new posts for the next two weeks! But this is also very relevant, I think. Very true. It’s all about putting the odds in your favour. And you can’t be achieving that if you’re targeting every single price move or price pattern.